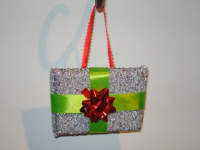 A gift that can be hung in your Christmas tree! 1. Gather your material. 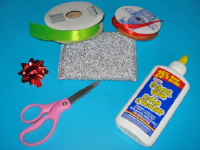 You will need a silver scouring pad, green ribbon, red ribbon, a red gift bow, scissors, and glue. 2. 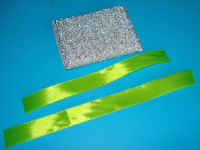 Cut two strips of green ribbon. 3. Glue them on the scouring pad as shown, forming a cross. 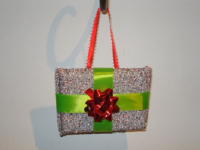 Stick the red gift bow in the centre, on top of the ribbon. 4. Cut a small piece of red ribbon. 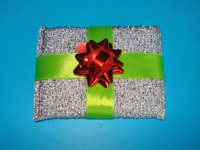 Glue the ends behind the scouring pad to create a loop that can be used to hang the miniature gift on a Christmas tree branch. 5. 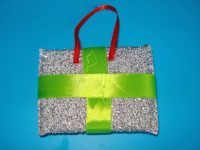 This simple craft will add a touch of shine to your Christmas décor.